Kochi: Amassive supply crunch in cardamom, following a drop in production, pushed the price of the commodity to Rs550 a kg on Saturday at the launch of electronic auctions at Vandanmedu in Idukki district in Kerala. The trade expects the price to cross Rs600 in the near term. The trade promotion body, Spices Board, estimates cardamom production to be down by 15%, to around 9,700 tonnes in fiscal 2008, from 11,235 tonnes the previous year. However, cardamom growers say production could decline by up to 30%. Growers blame the continuous rains for six months starting May for the low production. This has led to a rise in price of cardamom from Rs310 in August, when the plucking season starts, to Rs450 in November. T.T. Jose, managing director of MAS Enterprises Ltd, the existing Vandanmedu auction centre, which has now been leased to the board for conducting screen-based auctions, says the fall in cardamom sale through auctions is a reflection of the lower crop. “It is unlikely that the turnover will increase in the coming months because there is very little cardamom to be plucked except in a few pockets. 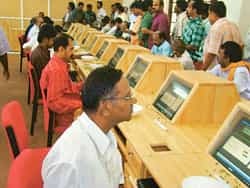 Jairam Ramesh, minister of state for commerce, who inaugurated the electronic auction at Vandanmedu on Saturday, says that other weekly auctions held in Kerala at four centres in Idukki district would now be held at the common e-auction centre at the MAS Enterprises auction hall. These centres were holding physical auctions of cardamom following the traditional system. “There was a fair degree of scepticism when we first launched online auction in August," Ramesh said. “Despite initial glitches and opposition from a section of the traders, e-auction is successful. Now all cardamom auctions across India will be under the electronic platform." At the centre, 60 trading computer terminals have been installed to conduct the auction process. Meanwhile, little progress has been made on the proposed spice park for cardamom and pepper in Idukki district for which a memorandum of understanding (MoU) was signed in February between the board and the Kerala Industrial Infrastructure Development Board, Kinfra. The state government has not yet identified land where the board would set up the infrastructure for cleaning, grading, value addition and packing of cardamom and pepper. Ramesh warned that in case the government fails to provide the land before 13 February, one year since the MoU was signed, the proposal may have to be dropped.